Climatic regulation pump unit for control of 1 or 2 circuits and request for energy (heat source), DHW production or solar circuit management, cooling system management. 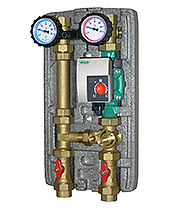 It is possible to connect one each other several hydraulic modules via CAN-Bus and to connect the new °Caleon room thermostat. The pump unit, by acquiring the value of the outside temperature, settles the right supply temperature of the installation on the base of the set climatic curve. The unit is supplied completely assembled and tested. No wiring operations are needed: the circulating pump, the servomotor of mixing valve and the climatic controller are pre-wired for a pratical and effective installation. Electronic circulating pump: Wilo Yonos PICO 25/1-6 or Wilo Yonos PICO 25/1-8. PN 6, max temperature 110°C. (max. 40°C ambient temperature and 95°C fluid temperature). Approximate data calculated with a Wilo Yonos PICO 25/1-6 circulating pump (6 m nominal lifting power). For power up to 20 kW (with Δt 8 K) and maximum flow 2150 l/h. Approximate data calculated with a Wilo Yonos PICO 25-1-8 circulating pump (8 m nominal lifting power). 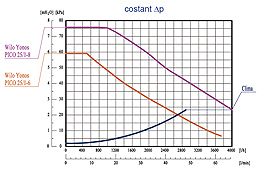 For an accurate measuring or higher flow, please refer to the curves of the circulating pumps (constant Δp and variable Δp). 3-way mixing valve with bi-directional servomotor with an operating range of 90°; led of activity in opening and closing mode. Selector for manual working with the indicator handwheel. A special connector allows to replace the servomotor in case of failure or bad working without having to operate on electric wires. Kvs Value of the mixing valve: 10,0. Wilo Yonos PICO 25/1-6 and Yonos PICO 25/1-8. 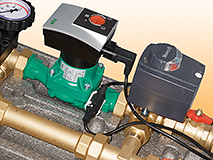 High efficiency circulating pumps with electronically commutated motor. 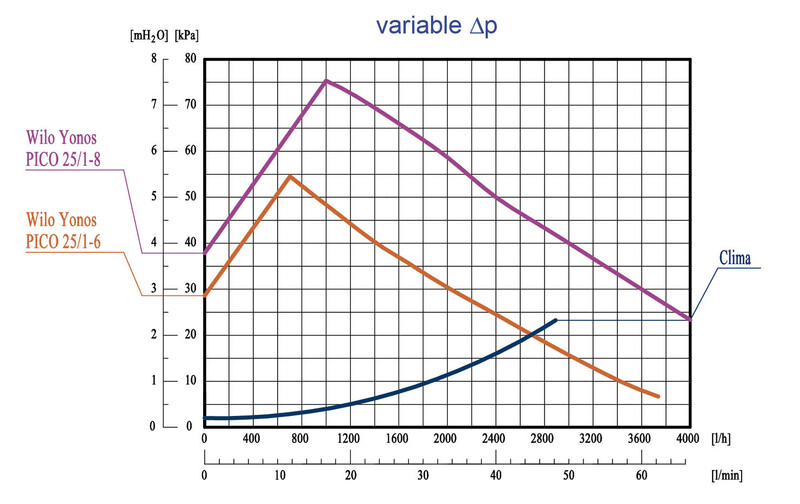 Integrated differential pressure control: constant Δp or variable Δp. 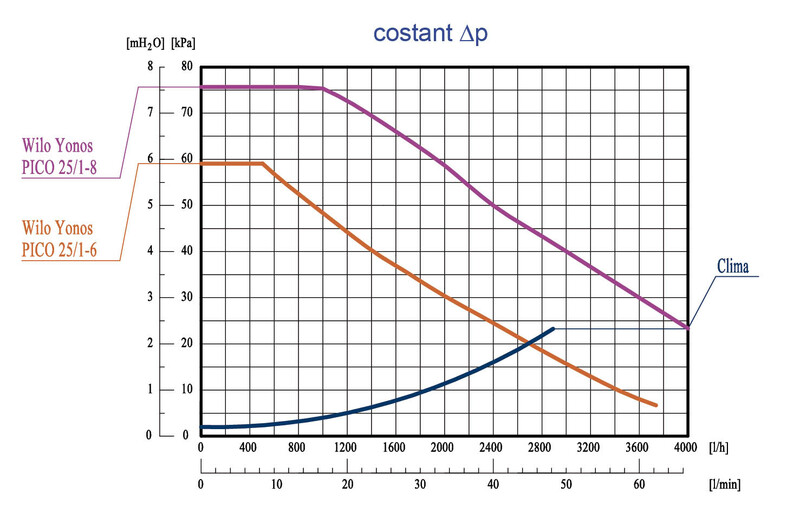 Constant Δp: for heating circuits with a stable pressure drop (i.g. underfloor heating) or plants where the pressure drop of pipes is negligible in comparison with the pressure drop of the thermostatic radiator valves, or where indipendently from open thermostatic radiator valves, same differential pressure is requested. 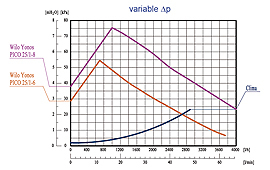 Variable Δp: in order to achieve the max energy saving and noise reduction. It is recommended in plants where the pressure drop of the pipes is higher than the pressure drops of the regulating valves, or more simply, when the requested differential pressure is decreasing when the flow comes down. In compliance with European Directive 2009/125/CE. Low energy consumption from 4 W to 40 W (Wilo Yonos PICO 25/1-6) and from 4 W to 75 W (Wilo Yonos PICO 25/1-8) at max flow. Automatic air vent program. Which allows a quick elimination of air during the first start of the plant. Molex automatic connector, which allows to replace the circulating pump in case of failure or bad working, without having to operate on electric wires. 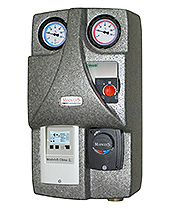 Climatic controller with wide LCD display to manage complex installations. Pictogram of selected hydraulic circuit with indication of the relays activity status: circulators, valves (mixing or diverting) and request of energy source. CAN-Bus connection to connect several pump units. Possibility of remote control and data backup thanks to the Connect system (the special Datalogger, not included, is necessary). Visualization of temperature of sensors. Active modality of working: day or night. Pre-setting of characteristic curves (1 or 2 circuits) with linear slope or broken and related day-night correctors. Daily up to three time bands can be set up: active in day modality or reduction night. Room thermostat °Caleon (optional). Elegant climatic control unit equipped with a touch-screen color display. It allows an easy remote management of the heating system.Operation modality: Normal, Turbo, Eco and Off with specific temperature set-point. Holiday program. 8 Selectable daily heating time slot. Cooling mode with thermostat °Caleon Clima. Clicking on the icon at side it is possible to download an Excel file dealing with the measuring and the check of a DN25 pump unit; it is possible to select the model and the working parameters, so getting a check of the power and of the residual lifting power. In case of underfloor heating system the surface that can be managed is approximately calculated. Changing the starting data it is possible to simulate different employment situations and to make your considerations.